For the past couple of months, I’ve been conducting a little experiment with Facebook’s Notes feature, and I’m ready to declare it something of a success. I got the idea from a post I saw on Facebook (surprise!). A Canadian journalist named Mitch Joel mentioned that he was going to begin using Facebook’s upgraded Notes feature as a blogging platform. For years, Joel said, bloggers have hosted their blogs on their websites, or on blogging platforms. Then they would put a link to their posts on social media in an effort to drive traffic to their own site. Once someone is there, the conventional thinking goes, they may take a look around and maybe even buy something from you. But readers are sometimes unwilling to click a random link to an unfamiliar site. And besides, they’re already on Facebook. 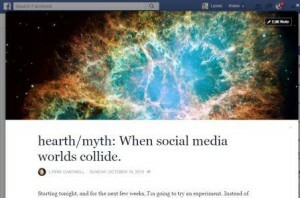 If the point is to get readers for your posts, why not blog where the readers are? So on October 18, I began my experiment. First, I wrote and published my post on my blog. Then I copied the post and published it twice on Facebook: once as a Note on my author page, and again as a Note on my timeline. I also posted links on Facebook to the posts on my blog, just as I have always done. I expected to run the trial for about three weeks. But with one thing and another, I’ve now been doing it for eight. I haven’t run the numbers for this week yet, so I’ll stick to reporting on my first seven weeks. 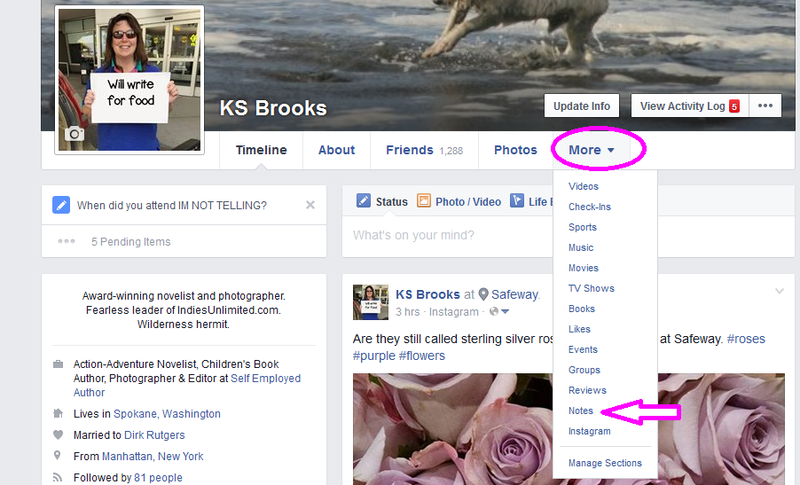 Here’s how you find Facebook Notes (on your profile) Click to enlarge. About the new Notes feature: You may remember Notes from a few years back, when it was a place to write longer posts than Facebook would otherwise allow. In the intervening years, they’ve pretty much done away with length limits on posts, so Notes went into hibernation until this past summer. The revamped feature looks a lot like a WordPress blog – the layout is very clean, with lots of white space on either side of the text and a big header photo. You can insert sub-headlines and other photos pretty much anywhere you want. Formatting is easy – highlighting the word or words you want to highlight brings up a dialog box that allows you to bold, italicize, or underline your text, or insert a hyperlink. When you hit “publish,” Facebook automatically posts a notification for you (subject to the usual restrictions on reach). You can’t track views/reach on a timeline post, as far as I know, so I can’t compare apples to apples exactly. But I can tell you that I definitely get more likes and comments on Notes posted to my timeline than I do to the ones posted to my author page. That seems a little unfair, as Facebook won’t let you pay to boost a Notes post (although paying for boosts has generally proven to be a waste of money – for me, anyway). I can, however, compare Facebook reach on my author page Notes vs. views on my blog. Because I use Blogger, my posts are automatically shared on Google Plus; I also give them a +1 manually. My reach and views are trending upward on both platforms: On October 18, I had a 34 reach/45 views; on November 29, I had a 313 reach/100 views. Some of the difference is likely to be content-related. My October 18 post simply explained the experiment, while my November 29 post was about what to do next with your NaNoWriMo novel. But I think there’s more going on here. I think publishing more places is causing my blog posts to be seen by more people. When I first announced my experiment, a friend in marketing cautioned me that cross-posting might cause Google to ding the Alexa rank on my blog for duplicate content. However, the opposite has happened. On October 11, the week before my experiment began, my blog was ranked a dismal 10,116,802 globally. As of December 5, I was at 4,916,776. Okay, just under five million is still pretty dismal – but it beats ten million. I think the big jump is due to several factors. For one thing, I had never claimed my blog on Alexa until partway through the experiment. Apparently claiming your site gives you a boost. But I was already moving up in rank before I did that. In addition, it turns out that it’s relatively easy to move up a lot when you’re in the cellar. This post from the Alexa blog explains how that works. Scroll down to where they talk about how the number of visitors to your site affects your rank – just a few more views can give you a big jump. Tl;dr: Reposting my blog posts to Facebook Notes has gained me some extra views, and so far there’s been very little down side. I intend to keep doing it. So, excellent – I can expand my experiment! Thanks for the excellent info, Lynne! I just added the Notes app to my FB page and published my 1st note, thanks to you! Wow–did not know this feature even existed! Thanks, Lynne! Thanks for the info–I had no idea that there was such a thing!! Thanks, Lynne! I remember the old Notes feature, but forgot all about it years ago. I’m glad to know it’s back! Thanks!! Found it and just published my first note. Just a side-note (no pun intended), but I needed to add the note app from my preference page so it would show up under the “more” tab. I’d also be concerned with using the notes as a person’s sole blogging platform (as opposed to the way you’re doing it) if the information is potentially of value because (a) it could go away at any time with no way to back it up (b) Facebook’s terms of service may claim some rights or ownership to content. Then there is the question of the goals a person has in doing the blog posts. If it is solely to get more people to read the blog posts, then the way you’re doing it makes sense. Any goal beyond that it might not. If a secondary goal is to bring in a few dollars, you kill most ways to monetize a blog doing this. If it is to get a portion to buy your book, can you have buy links in a note? You may be right, Al — I may have misunderstood what he meant by rank. The only sort of rank I could think of was Alexa, but he may have meant searching via Google. I doubt very much that my blog would come up high in searches, anyway. How would one test it? Google will give me my own site first in every instance. Is there a way to look at it on the back end (that doesn’t cost money)? Apparently the page rank is a number from 0 to 10. I’d be getting into dangerous territory to interpret what they mean or guess at everything that goes into assigning the number, but I ran a few sites through it to get ranks. hearth-myth.com gave an N/A. I dug into that because the explanation it gave didn’t sound good since one of the reasons for that it gave was the site had been “banned” from Google. But doing a Google search of the domain name got lots of results, so it probably means it needs to be updated and will has results in a few days. You’re right, that Blogger and the free Word Press blogs have risk as well. At least in the case of Blogger you can back up the site, but to then do anything with it would probably require someone with technical skills. (I suspect the same is possible for free Word Press sites. It wouldn’t be for Facebook notes, at least that I’m aware.) However, this would require you to do that backup on a regular basis. I know in my case that means it wouldn’t happen. I’m not surprised at the 0/10 rank for lynnecantwell.com — I haven’t updated the place in yarons. Even the spammers seem to have given up on it. If Facebook is a medium you enjoy then yes, using the Notes feature makes a lot of sense. Are you seeing any improvement in sales as a result? I’ve seen more sales lately, yes, but I’d attribute that to the fact that I’ve stepped up advertising for my books. I’d quit doing that for several months. Thanks, Lynne. Have all Facebook pages got this feature yet? I checked both my personal profile and my fan page and it’s not on either. I think they’re rolling it out in stages, J.P. This is interesting. I started a blog on WordPress in August and am pleased with how it is going. One concern is with BigAl’s comment about monetizing a blog. At some point in the future I plan to combine my blogs into a book for Kindle. Does Facebook terms of service or rights affect this? Richard, when BigAl talks about monetizing a blog, he’s talking about putting ads and affiliate links on the blog itself. Publishing your blog posts in a collection shouldn’t be a problem. But I’m not a lawyer, nor do I work for Facebook, so it would be worth checking on whether what my gut tells me is right. 🙂 Good luck! Thank you, Lynne! This looks like a fun idea, and in fact I stole it from Lynne right after she started. For me, it’s a handy way to post flash fiction or other writing excerpts I want to share. Another cool use for this feature. Thanks, Laurie! Wow! What a great post (or is it “note?). I’m going to give it a try, and also share a link to this on my Facebook page. Thanks for sharing! This is so funny because just yesterday I was trying to decide whether or not to give notes another try and decided to do a little research. After they first introduced the new and improved notes there was a Notes link on the sidebar (or whatever it’s called on Facebook) just like pages but that’s now gone. At first I thought that might be because of my hundreds of friends not a single one uses notes, but then remembered several did publish notes after the initial upgrade, so no clue what has happened with that link. Anyway, my search turned up no note posts so apparently the only way to find them is if you happen to be following someone who uses them. That convinced me not to invest the time on notes right now, but I’m glad to hear it worked for you and will take another look when and if they ever upgrade notes for pages. Thanks! Check the More tab on your page — I can access the upgraded Notes for my page there. As for the sidebar link, I think FB ranks those in the order you use them. If you haven’t used it in a while, it may have dropped farther down the list. You may be able to re-order the list in your settings. I don’t use WordPress, so I’m stumped. Maybe someone else can help. Anybody? I hope. I’m still not sure its purpose though. Who sees the posts on Notes? You know how Facebook notifies your friends (or the public, depending on how you have it set) when you make a regular post? When you publish a new Note, Facebook automatically sends the notification for you. So either your friends, friends of your friends, or the public will see it, depending on how you’ve set permissions on the Note. I think I just need to keep an eye on what people are posting there. I went in but didn’t see how the posts were different from any others on FB. I’m not sure how it can be used for promotion. Especially since it won’t let me post under my pen name. Anyone out there have an answer for Kate? I am clueless. Good post! Thank you. I have just tried to add a note, but I don’t have any of the editing features mentioned in mine. Is this something you have to add? Nope, it should be there from the start, Susanne. If you hover over the paragraph, you should get a box in the left margin for headings, bullets and numbering, and inserting photos. Highlighting a word or words in a paragraph brings up a box right above the text for bold/italic/underline and inserting hyperlinks. No idea this was an option – going to try and figure it out this coming weekend! Thanks for the idea!